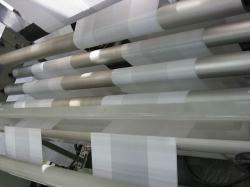 A common problem in film cutting machines is length measurement due the elasticity of the plastic film. During film feed tension distorts length measurement. In cases of printed film printed area must stay in between cuts. With the use of photocell sensors and printmark register correcting movements are made by the feeder. In that way cutting head always cuts according to the register. Bad printing areas sometimes occur. Extra care has been taken for such ocasions. When no register is found calculated length is applied, machine does not stop and production continues until next register.